“The cel­eb­rated artists‹ col­lect­ive Gen­er­al Idea pion­eered artist­ic col­lab­or­a­tion in the 1970s and 80s, and became a mod­el for artist-ini­ti­ated activ­it­ies, integ­rat­ing uncon­ven­tion­al formats and lan­guages and address­ing the AIDS crisis in the 1980s. Gen­er­al Idea, which in addi­tion to AA Bron­son included Felix Partz and Jorge Zont­al, pro­duced a vast body of work in a large vari­ety of media, includ­ing per­form­ance, install­a­tion, paint­ing, sculp­ture and pho­to­graphy. The group had an extens­ive out­put of low-cost pub­lic­a­tions and mul­tiples, and were pion­eers in video art. After pub­lish­ing FILE magazine (1972 – 89) over a two-year peri­od, Gen­er­al Idea foun­ded Art Met­ro­pole in 1974 as an artist-run archive and dis­tri­bu­tion centre for artists‹ edi­tions and pub­lic­a­tions. Since 2004, AA Bron­son is the Exec­ut­ive Dir­ect­or of Prin­ted Mat­ter, a non-profit altern­at­ive art space fore­ground­ing the book as a ven­ue and medi­um for artists‹ pro­jects and ideas. 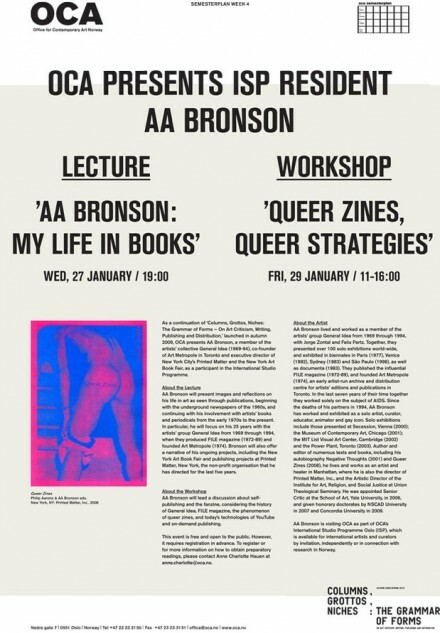 Dur­ing his ISP res­id­ency at OCA, Bron­son presents a lec­ture, a work­shop and a pro­ject focus­ing on DIY pub­lish­ing, FILE magazine and queer zines. Addi­tion­ally, Tor­pedo Book­shop will present a selec­tion of ori­gin­al FILE magazines and Gen­er­al Idea edi­tions from Torpedo’s archive at Tor­pedo Book­shop on 28 Janu­ary at 19:00 at Haus­manngate 42.